2 for 3 direct damage + 3 damage to an opposing character? Seems like a decent combo to me. Plus if you actually use the Mr. Sinister you can get some Retaliation in as well, even for your opponent's Villains. This is the most beautiful thing I've seen today. My dream of an all-bolt villain team is at hand! 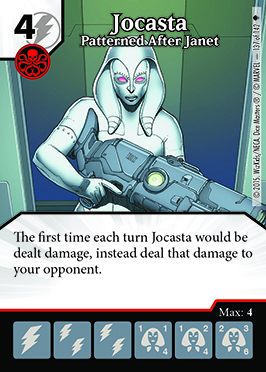 If you have multiple Jocasta dice in the field, does her ability trigger off of each individual die? What about dropping a fireball on 3 or 4 of her. Use the ability on fireball to pump 5 or so extra damage in to her when you use Fireball. How about Mjolnir? That was my first thought when I saw her. I don't think he would counter the Mr.Sinister stuff though since that is a global ability. Now that I'm thinking about this...Jocasta may be the most Meta changing thing in the AOU set. Not just because of her inclusion in different teams, but also for the stuff that we may now be forced to consider in order to counter the crazy shenanigans that she can do. Good call. That could be 6 to 8 damage to your opponent for each Jocasta you have in play. Ouch! Get a Baron Zemo: Thunderbolt in play and you could have Mjolnir go to Prep instead of Used. I guess you could then take Loki Laufeyson to counter Captain America. This is going to be fun. Question because I don't know...would you legally be allowed to activate that Loki ability, and then subsequently activate Mjolnir before I had the chance to use a global myself? If I have the chance to ping Jacosta for 1 damage using the global on Magic Missle or something, I essentially just "deactivated" her ability, and your Mjolnir plan no longer works. What I'm not sure of is...If you are activating Loki, then you've technically entered the globals portion at the end of the main step, so are you legally allowed to use an action in this same step? The thing about Jacosta is that timing will be crucial, because she only triggers the first time she takes damage each turn. The main step doesn't have "portions". You, as the Active Player, do whatever you want, as much as you want, including buying, fielding, using action dice, and using Globals (all in any order). Then you pass priority to the Inactive Player. So I could absolutely use Loki's staff Action Die, then Mjolnir Action die on Jocasta. If this ability is per Jocasta die, and not just once for ALL of her dice, then why not field a few villains and start bouncing Batarang - From Wayne Enterprises off their heads until it builds up enough "velocity" to do some REAL damage to your opponent? The way that rundown on the back page of some of the other rulebooks was written, seemed to imply that there was somewhat of an order within the main step, and "Both players can use globals" was always at the end, after "use action die"...hence my earlier question. I just referred to the AOU rulebook and it does say right at the top of the main step that these things can be done in any order...but I suppose "Both players can use globals" is still a bit misleading, because as the inactive player, I can't interrupt the active players main step to use a global...right? Step 1: Field 3 Jocastas. Correct. Both players can use Globals during the Main Step, but the Active Player always has priority to do as much as they want first (from 1 to all possible actions). See: Tournament Rules. Whats the code to put in AoU characters. Throw in Pandora's Box, if you're doing that! Pretty sure it's once per turn no matter how many dice are fielded, not once per die. Still makes the hammer a scary item. I think you are right, on both counts. That still puts a clock on the game, especially if you can pull that action die back out of used amd prep it again. Maybe something like Lex Luthor Former President. Try common and uncommon Elf Wizard! I don't see how. A character card can't "take damage", only a character die can do that. So it seems logical to me that when they say "Jocasta" they must be referring to each individual die. Which I definitely interpret as each Curse of Dragon receiving the bonus. I think I would rule per die at this point, but I could see the official ruling going the other way. I think its as a whole. Either that or they are going to have to contradict existing rulings that say that self-referential abilities are per die. We'll have to see in the live play testing and coming months. We will certainly have to see. I think, if it's once per ANY die, then it's merely a very very good card. If it's once more per EACH die (which I think it might be now that I'm looking at it early morning), then it's a fantastic card that'll cause some changes in the overall meta. At least, it will in my area as I exploit it.